PLEASE NOTE: EVENT IS SOLD OUT AS OF 6/16/17. Confirmed package holders may still use registration site to enter guest names. 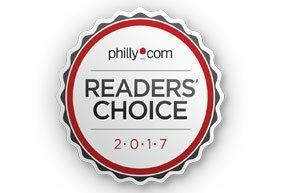 Celebrate Philadelphia's favorites as voted on by the readers of The Philadelphia Inquirer, Daily News and Philly.com. Winners represent local business in the following categories: Food & Dining, Recreation & Entertainment, Home & Services, Wellness & Personal Care, Shopping and School Spirit. Here's your chance to socialize and support local businesses in the region and witness a first-time reveal of where they placed! In conjunction with the event, Philadelphia Inquirer produces a special print section acknowledging the winners on Thursday, June 22. When: Wednesday, June 21, 5:30 p.m. - 8:30 p.m. Closest self-parking garage is Love Park, 1500 Arch Street. Standard rates apply. Placement of the company logo adjacent to "After Event Photo Page"
Placement of company name adjacent to "After Event Photo Page"